This section of the guide details some trains which will further develop your usefulness in Nullsec. This second part expects that you have already gone through the training in the “Quick Trains“, Guide and assume that you have already completed all the training within that. Let me address the Elephant in the room, while he is still buttering up to get through the doorway. This is going to be a long set of skill training. You’ve trained for 6 months now to get some ships which are brilliant at getting you into fleets. Hopefully you’ve found it beneficial, hopefully you have found a place within fleets to prosper and shine. Hopefully despite your low skill points your Alliance mates welcome you on fleets and consider you a valuable asset. Even if all this is true, the chances are you are still aching to get into a bog standard ship of the line. A good battleship, or cruiser perhaps. Something which lets you join in with the pack on their level. I would advise that you go ahead and scratch the itch. With the three ship types you trained already you should be all but assured access to fleets, and all regimented training and no impulse ships makes jack a dull boy. So go ahead, indulge. Perhaps you might even consider training the next section alongside some impulse training, 1:1 guide/impulse skills might make this go on forever, but something like a 2:1 might keep you going through what is going to be a long set of training skills. Let’s touch on that some more. This second set of ships is going to be longer that what you have seen in the first guide. A lot longer. The true aim here is to bring you into the vaunted Logistics Cruisers. What before we do go into that however we will be bringing you into T1 Cruiser Hulls (similar to how the moved into T1 Frigate Hulls), so that you can learn the ropes in something cheaper. So it’s going to take a long time but the fact of the matter is that if you want to be truly versatile in your training, you are going to need to invest this kind of time into these ships. For some people the quick trains will be enough to be getting on with, certainly 90% of fleets will allow you in with the ships you trained for in the first 6 months. But if you finish this next set of training skills, 90% of Alliances will let you in just based on your skills (and eventually, experience). It’s a big load and will take you a further 30 days, but will serve to solidify your core competency. This will allow you to participate in any cruiser doctrines and will prep you for the next batch of Medium length trains. Dabble in logistics now, while the ships are cheap and reap the rewards later when you’re flying a 200m ship in a fleet of T1 cruisers. This is the life of the logistics pilot. For the first time I am going to advise you to not train all four races ships. From my experience the two races which are most likely to get you into fleets are the Minmattar and Gallente ships. With Webbing and Tackle modules these ships are always useful in a fleet, and are called for/accepted most of the time. As an added bonus, is a nice transition up from the Frigate size tackling ships you have been previously using. The tactics will be a little different, as you will now have longer range modules to do the tackling with, so you no longer need to charge into the enemy to forfill your role. Instead you will either be with the main fleet, or self-piloting on the edge of the enemies range, but within your logistics range. Again this all varies with how your FC likes to run things, so always ask about before you do something. Train Recon Ships to level IV before you start flying them. That’s it. All in this will take an additional 100 days to train, but will get you into a new more durable role. This next one is the big one. Now we are moving into the big leagues. Logistics will not only get you into fleets, but it will also get you into Alliances. My acceptance into Pandemic Legion was highly influenced by my logistics specialisation, it certainly wasn’t the only factor which got me in, but it played a big role. But logistics isn’t a simple train, nor is it an easy upgrade from the ships you have been flying so far (with the exception of the T1 logistics ships you should be been learning in), it’s a whole new world of play. In all honestly taking the additional 60 days to train all of these to V (with the exception of advanced target management for which no ship can use higher than the 8 Advanced lvl 3 gives you), is worth the extra time. So there we go. 278 days’ worth of training in this “Medium” trains guide, on top of our original set that a total of 462 days’ worth of training. I hope you have been enjoying Nullsec, because you’ve become pretty invested in it! Seriously however, I really believe that if you can make it this far, your time in Null is all but assured. In my next section I will be looking at the true long term ships including one which I believe it 100% required for every Nullsec Pilot (not even as a combat pilot, just as a matter of personal self-sufficiency). Until then however, get reping. If you had asked me a month ago if the changes to Interceptors would see me returning to these wonderful little ships, I would had said “Sadly not”. I would have then gona one to add that the 20m+ cost of new clones along with the expensive implants in Hark’s head means that flying fragile ships is on paper a not worthwhile risk. In practice however, it turns out that the changes are just enough to tempt me back (at least for now). I should point out that interceptors have always held a special place in my heart, as I began my 0.0 experience flying tackle for ED during their finals stand back is Etherium Reach. 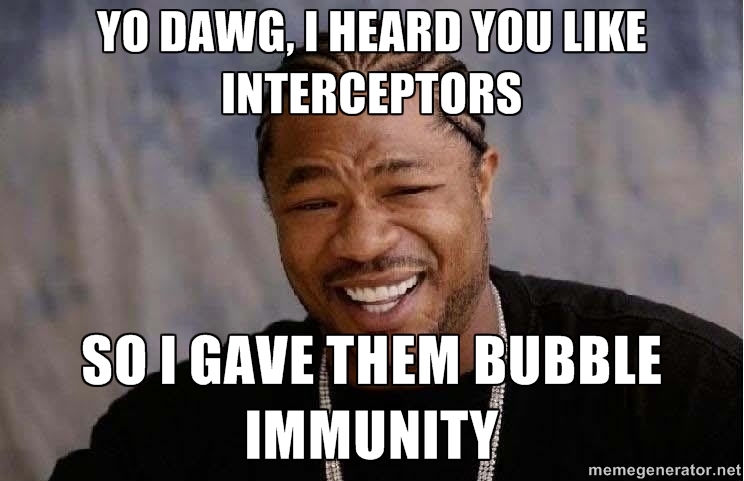 So when we saw Interceptor fleets being announced post Rubicon, I decided I would throw caution to the wind, and try them out at least once. My goodness am I glad I did. It’s pretty easy for a ceptor’ fleet to cover tens of jumps in a handful of minuets. This means we can move faster than the speed of information, so we catch ratters unawares. It also means that we can move faster to the hero bait ship a few jumps away, and still arrive before he dies. Finally we can overtake people who try to run away from us. On one of our fleets, we landed on grid just as a Raven warped to a gate, we followed his warp and beat him to the gate by a good 5-10 seconds needless to say he then died. Engagement gone sour? No problem, just align to the sun and coast out of trouble. At several points we outstayed our welcome on grid, and had to extract quickly. In a normal fleet this could have been fatal, but in Intys, we didn’t even have to warp out to get safe. This also means that should you look like you’re going down, your chances of getting your pod out is pretty good. Even under scram and web, if you are quick you can coast out of a bubble to allow your pod to escape. It’s obvious, I know but this has an unexpected ramification. You can go on an Inty fleet even if you know you only have 10 minutes till you have to walk away from the PC. When the time comes to leave fleet, you can simply find a quiet location to log off, and be safe in the knowledge that to get yourself home safe you need only worry about insterlocking gate camps on the way. The Inty gangs have been amazing, and despite the worry of a pod-mail 5-6 times the ship loss mail, the allure of speed and easy kills is just too much to resist. Especially with kills like the afore mentioned Raven possible. The Inty fleets also got me the funniest kill I have had in a very long while where we destroyed a Rapier who though he was safe to engage in Station docking range. He had carrier providing reps against our 30 interceptors: and went down after hull tanking the reps for a good couple of minutes. The interceptor change has been fantastic and without doubt my highlight of the Rubicon expansion. I have to admit that this is going to be an interesting monthly update to write. This is because quite simply, I am having trouble remembering the first half of this month. Unfortunately this is not because of some alcohol induced coma, but instead because I have been so busy out of game, I just can’t remember that much of what I’ve been up to. P.s. a tip for anyone thinking of tiling a kitchen floor themselves: don’t. That said I clearly have been playing games, with my raptor account scoring 140 hours played this month (an average of 5 hours per day). If I am honest through, that’s a dramatically inflated number, as I have been using my Tablet to run games in the background while I am at work; steam badge collection, for the use of. I think it’s fair enough to say that a good 20-40 hours of that time is this background running. Of that inflated 140 hours of games, I have managed to rack up 40 hours of eve, and 73 kills across all my accounts (working out at just under two kills an hour average). I also had the great pleasure of a weeklong visit from fellow dirties members Arian Blade and a weekend visit from Lore Solo. We took the opportunity to run some awesome group roams thought faction warfare experimenting with some crazy fun frigate fits. We are going to try and expand these roams, and make them a regular feature. Who knows, maybe you’ll see some reports on here of what we get up to at some point. In-between laying tiles, I have been enjoying a lot of Dust, especially working on the triple XP event over the last weekend. I’ve had a great time overall, but I am still severally disappointed by the low level of investment I’ve been able to make. I have also developed a distinct hatred of Death Taxies, to the point where by I just won’t talk about them in this update for fear of a fevered rant. Needless to say I find them… aggravating. Back on the eve front, the Dirties group has also been experimenting with some new ways of working together to make money. So far things are looking positive, with us making a few Hundred Million for just a few hours’ work. To me its highlighted once again just how much eve makes us invest in our accounts and characters. Although this new plan is in its infant stages, eventually it is going to require some skill training before we can take it to the next level. I have always been one of life’s “planners”, and eve tickles that itch like nothing else. Spending time planning something which is going to take a few months, then walking it through the stages, to perfection… It’s a feel good factor for me. Mind you, you may have already gathered that from my Attribute optimisation post. Anyway, well see if we can talk about those plans at a later date, for now it’s all opsec and jazz. Site wise I have also been doing some *fun* changes. If you visited over the last few days, you might have noticed that the site has been changing its clothes more than a Eurovision song Contest host. I wish it were for good reasons, but recently I have been un able to ignore the extremely slow load times (please tell me it’s not in my mind, and that readers are getting this as well). So far I think I have narrowed it down to just a few possibilities, and the site is currently running in “Cut down” mode, so that I can test my theories. Sadly being the main contributor to this site, and also being its sole administrator does mean that I sometimes have to pick between writing new content for you guys to read, and updating/optimising and generally administrating this site. Sadly that has resulted in a slowdown of posts in the last few weeks. We’ll just have to hope this is still just the initial overhead to get this site running on its own. Anyway, I’m back to trying to get more fleets again, as I have been lacking in my destruction duties for the last couple of weeks. I doubt that ill manage that to any serious capacity until I have finished my work in the kitchen.